In a world of busyness, noise, and distraction one sometimes seeks a place of stillness, silence, and centeredness. Sometimes this means making a change in our external circumstances, always, though, it is about our inner enviroment. I have found that the loudest voices and the longest to-do lists are usually within me and not around me. I have also discovered that certain music is able to take me to a place of silence, stillness, and presence. 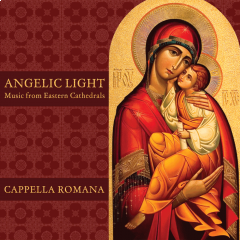 Cappella Romana’s Angelic Light (available through Valley Entertainment or iTunes) is that kind of music. Angelic Light is prayerful and beautiful. It is music but it is also silence. It is movement but it is also stillness. That for me is what begins to really define and explain good sacred music. It takes us to that deep place within, the place where we can be still and know that he is God. Lovely. I have also enjoyed the Voices of Ascension singing sacred choral music. Peace. I am glad you liked it Chris. Thanks for pointing me to Voices of Ascension. Beautiful to listen to. Enjoyed it immensely. Thanks Mike. Don, so glad you enjoyed it. I am listening to it again this morning. Thanks. Just what I needed this morning.